Today I am joined by Guest chef Adam Guthrie from www.ifeelgood.com.au. 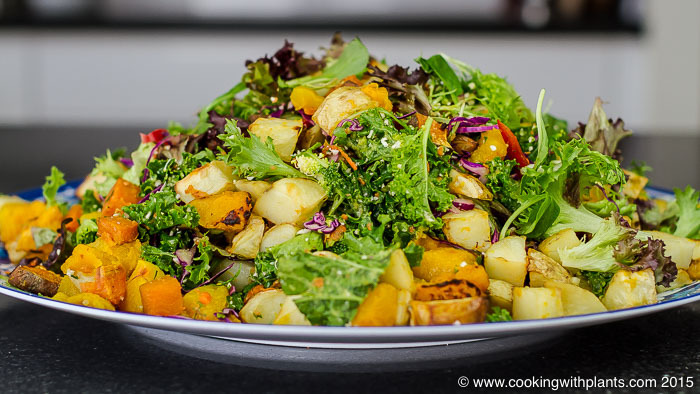 He shows us how to make his favorite plant based roast vegetable whole food salad, as well as sharing some of his tips and tricks on how to use chopping knife like a true chef! Simple flavors and a mixture of textures combined beautifully into a delicious meal. Bake all root vegetables (potato, sweet potato, pumpkin) in a hot oven (220 degrees celsius/440 degrees fahrenheit). Cook on non-stick parchment paper for about 20 minutes, then toss and turn over and bake until cooked through and crispy on the outside. In a big bowl or on a large platter, tear the kale leaves into small pieces and massage through some avocado until kale is very soft. Add remaining greens and salad ingredients and toss through gently until well combined. Top with fresh lemon juice and celtic sea salt to taste. Enjoy! This is a very versatile salad and you can add any salad ingredients that you have in your refrigerator. I cannot eat avocado so what can I use in the roast vegetable garden salad? I just love your recipes – tasty, easy and delicious. Hi Anja, I made this recipe last week and it was absolutely delicious. Loved the texture of the kale and advacado massaged together? We had leftovers for lunch the following day. Fantastic 🙂 So glad you made it and like it. I really like the idea of massaging the kale with avocado – will definitely try it!